Daily rhythm – 900 Nm. You set the pace. Your vehicle makes the rest possible: with catapult-like acceleration accompanied by the powerful bass of the new, switchable AMG performance exhaust system with double tailpipe trim elements. A luxury vehicle could scarcely be more emotional. And you are sitting right in the midst of it. The new Mercedes-AMG S 63 4MATIC+ accelerates from 0 to 100 km/h in just 3.5 seconds thanks to its 450 kw (612 hp) and 900 Nm powerful AMG 4.0-liter V8 biturbo engine. We wanted to create more than an automobile. 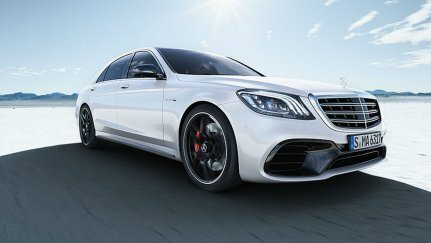 It became a symbol for modern luxury: the Mercedes-AMG S 63 4MATIC+. The AMG-typical front with large air inlets at the jet wing, as well as the characteristic grille with AMG logo, already make the observer’s eyes twinkle. The design credo of our work is clearly visible throughout the entire side view, right up to the rear of the vehicle: luxurious dynamics. Sporty design features dominate the exclusive Mercedes-AMG exterior. The distinctively styled front end radiates superior performance with its radiator grille in high-gloss chrome and AMG front apron with black jet wing. Voluminous air inlets include two transverse fins for optimized engine cooling. Even when viewed from the side, the Mercedes-AMG exterior is made more dynamic by the "V8 BITURBO 4MATIC+" lettering and individually styled AMG side sill panels. The 48.3 cm (19-inch) AMG 10-spoke forged wheels in titanium gray and polished allow a view of the generously dimensioned AMG high-performance composite braking system with gray brake calipers. The rear view rounds off the dynamic looks of the Mercedes-AMG S 63 4MATIC+. The AMG rear apron with black diffuser insert surrounds the two chrome-plated twin tailpipe trim elements of the switchable AMG Performance exhaust system. The high-grade trim strip in high-gloss chrome adds an elegant visual accent. The Mercedes-AMG S 63 4MATIC+ comes standard-equipped with 48.3 cm (19-inch) 10-spoke forged wheels in titanium gray with a polished finish, with 255/45 R 19 on 8.5 J x 19 ET39 (front) and 285/40 R 19 on 9.5 J x 19 ET39 (rear). Newly available are 50.8 cm (20-inch) cross-spoke forged wheels, which are available both in titanium gray, with a high-sheen rim flange with a polished finish, and in matte black with high-sheen rim flange; both featuring fully integrated wheel bolt covers. In addition, 50.8 cm (20-inch) 5-spoke light-alloy wheels in titanium gray with high-sheen finish, as well as 5-twin-spoke forged wheels in titanium gray and polished, are optionally available, including black wheel bolt cover in the same size. Moreover, 50.8 cm (20-inch) 10-spoke forged wheels are also available in titanium gray with a polished finish, or in matte black with high-sheen rim flange, both including fully integrated wheel bolt covers. Large, internally ventilated and perforated brake discs provide excellent deceleration. The composite design improves resistance to fading even under extreme conditions and reduces unsprung masses on the wheels. Upon request, the brake calipers are available in red. The AMG high-performance ceramic composite braking system ensures extremely short stopping distances, a precise pressure point and outstanding fade resistance even under extreme operating conditions. The AMG ceramic high-performance composite braking system offers racetrack braking performance accompanied by weight savings of around 40% over conventional composite brake discs. Whether the sonorous sound typical of AMG or a restrained noise generation, the sound of the AMG Performance exhaust system fully adapts to the currently selected drive program by means of three variably adjustable exhaust flaps. The driver can also change the sound characteristics with the press of a button. This optional equipment allows a maximum expansion of the soundscape from comfortable to highly emotive. Three exhaust flaps allow for even greater differentiation of the sound characteristics. The sound characteristics are dependent on the currently selected drive program extending from rich in drive programs C and S, to emphatically sporty in mode S+. This is controlled by means of a variably adjustable exhaust flap without loss of power. The exhaust flaps is controlled depending upon both engine speed and load, ensuring a 100% power delivery. If desired, the cold start noise can be reduced in drive programs C and S. A double-declutch (in S) and controlled misfire (in S+) emphasize the sporty characteristics of the particular drive programs. Trim strip on the jet wing of the front spoiler in high-gloss black, inserts in AMG side spoilers in high-gloss black, exterior mirror housings in high-gloss black, trim strip of the rear spoiler in high-gloss black, black chrome double tailpipe trim elements. Jet wing of the front spoiler in carbon as well as exterior mirror housing in carbon, insert in the side spoilers in carbon, upper insert of the rear spoiler in carbon. Enjoy the time and always be a step ahead of it. Futuristic control panel and display elements, as well as exquisite, perfectly finished materials. Every handle in the interior of the Mercedes-AMG S 63 4MATIC+ turns into a luxury experience. Starting with the AMG Performance steering wheel right down to the AMG sports seats with specific upholstery, which provide excellent lateral support. Optimized lateral support is provided by the AMG sports seats with AMG nappa leather upholstery, an AMG-specific V8 seat upholstery layout, and contrasting topstitching. Exclusive detail: AMG badges in the seat backrests at front and rear. Specific displays in the AMG widescreen cockpit. The capabilities are highlighted by additional information regarding engine/transmission oil temperature, manifold pressure or instruments such as the G-meter and RACETIMER. The speedometer scale, which is extended to 330 km/h, also unmistakably points to the potential of the V8 biturbo engine. The AMG widescreen cockpit merges the AMG-specific instrument cluster (31.2 cm diagonal / 12.3-inch) with the AMG-specific media display (31.2 cm diagonal / 12.3-inch) into a single unit offering high-resolution HD visualizations. It provides three display styles for the AMG instrument cluster; "Classic," "Sporty" and "Progressive." Additional AMG-specific information in the instrument cluster includes warm-up, set-up, G-meter, RACETIMER, and engine data. The First Class Rear, comprising two single seats with continuous business console including temperature-controlled cup holder, already impresses with a generous amount of space. With up to 12 motors per seat, the seats adjust in a tailor-made manner to suit any body size. Access to the infotainment or telephony features is just as convenient. An exceptional highlight is the Executive seat on the front passenger side with thigh support and backrest adjustment of up to 43.5 degrees for an optimum reclining position. The state-of-the-art Rear Seat Entertainment System (optionally available) includes two displays, a remote control, Blu-ray drive, USB and AUX ports in each case, as well as two optional sets of wireless headphones. Exceeding our own expectations again and again: that’s what drives us. And this is what is expressed by the completely newly developed, innovative all-wheel drive system AMG Performance 4MATIC+. An electromechanically controlled clutch provides for the variable connection of the permanently driven rear axle with the front axle. In other words, this enables you to drive the Mercedes-AMG S 63 4MATIC+ seamless variable from traction-oriented all-wheel drive to 100% rear-wheel drive, as the ideal torque distribution is calculated continuously. This ensures extremely powerful acceleration maneuvers and improves driving stability and handling safety on dry road surfaces as well as on wet or snowy roads. AMG SPEEDSHIFT MCT 9-Speed Sport Transmission. The AMG 4.0-liter V8 biturbo engine in the S 63 4MATIC+ comes exclusively in the highest performance level to date, rated at 450 kW (612 hp). The peak torque of 900 Nm also represents a new maximum. It is available across a wide rev range between 2750 and 4500 rpm, and thereby provides a sense of superior poise. The sprint from 0 to 100 km/h takes just 3.5 seconds, faster than in any other performance luxury saloon, and the dynamic push in the back does not end before reaching the electronically limited top speed of 250 km/h (with AMG Driver's Package: 300 km/h). The further advanced AMG 4.0-liter V8 biturbo engine utilizes well-proven twin-turbo forced induction, with the two chargers located not outside on the cylinder banks, but rather between them in the V of the cylinders. The advantages of the "hot inner V" include a compact engine design, an immediate response from the turbochargers and low exhaust emissions thanks to optimum airflow to the close-coupled catalytic converters. Two twin-scroll turbochargers provide even better fresh-mixture cylinder charge. The results are a higher output, more torque even at low engine speeds, and a very spontaneous throttle response. For maximum efficiency, Mercedes-AMG equipped the V8 engine in the S 63 4MATIC+ with the AMG Cylinder Management cylinder deactivation system. In the partial-load range, cylinders two, three, five and eight are deactivated, which significantly lowers the fuel consumption. With a combined fuel consumption of 8.9 liters and combined CO2 emissions of 203 grams per kilometer, the new S 63 4MATIC+ is among the leaders in its competitive segment. With seven speeds as well as RACE START and double-clutching functions, this transmission allows extremely dynamic acceleration and ultra-short shift times as well as a fuel-saving driving style. The systematic further development of hardware and software has made it possible to further optimize the reaction times. This means that the driver's shift commands can be carried out faster than ever before. Gear shift operations are executed with no interruption in tractive power. Ultra-fast, responsive multiple downshifts are another forte of the AMG SPEEDSHIFT MCT 9-speed sport transmission. The driver can change via kickdown directly from 9th into 6th or from 5th into 2nd gear, for example. The RACE START function supports optimal acceleration from a standstill like at the starting line in motorsport events. The performance-oriented all-wheel drive with fully variable torque distribution combines optimum traction, hallmark AMG driving dynamics and the ultimate in driving enjoyment. It improves handling safety and adhesion to the roadway on wet or wintry road surfaces Thanks to the fully variable torque distribution, the driver benefits from the advantages of all-wheel drive and rear-wheel drive in equal measure. An electronically controlled clutch provides for a variable connection of the permanently driven rear axle with the front axle. The ideal torque distribution is calculated continuously depending on the given driving situation and the driver's wishes. This enables a seamless transition from traction-oriented all-wheel drive to 100% rear-wheel drive. In addition to traction and transverse dynamics, the all-wheel drive also improves the longitudinal dynamics of the vehicle for even more dynamic acceleration. AMG Sports Suspension Based On AIRMATIC. Outstanding agility and vehicle control is ensured by the AMG sports suspension, which is based on AIRMATIC, with AMG-specific kinematics, elastokinematics and parameterization of the variable damper control. The driver can select from two settings: for a high level of comfort on long journeys or increasingly sporty and stiff. A progressive piston geometry leads to much higher air spring rates. This reduces body roll and pitching at an early stage for improved vehicle control. The stiff kinematics combined with coordinated damping ensure the best possible handling characteristics right up to the physical limits, even at maximum speed. The greater camber rigidity and higher basic camber counter any tendency to understeer, supporting neutral and agile handling characteristics. To achieve handling characteristics that are virtually independent of the vehicle load, the AMG sports suspension, which is based on AIRMATIC, responds to added weight by increasing the pressure in the air spring. This increases both the spring rate and the spring force. At the same time, the pneumatic all-round level control system ensures a constant vehicle level. With the selected drive program, parameters such as the characteristics of the engine, transmission, suspension, ESP®, steering and sound of the exhaust system change to provide an even sportier vehicle set-up: more agile accelerator pedal characteristics with a more direct set-up, shorter shift times and significantly more emotive gear changes. The dynamic characteristics of the vehicle are supported by additional functions such as a double-declutching function, cylinder shut-off, active downshifting and start-up in "Sport" and "Sport+" mode. The last-selected drive program remains active for 4 hours after switching off the vehicle, after which the default setting of the balanced and fuel-efficient "Comfort" mode is enabled. The "Individual" drive program allows drivers to adjust the various parameters, from the steering and powertrain to the suspension, to suit their own requirements. In addition, drivers can use the "M" button to switch straight to manual mode, enabling gear changing using the steering wheel gearshift paddles only. More agility and dynamism are provided by the "Sport" drive program, whose features include sporty, firm suspension tuning with modified shift points. The sporty attributes can be even further enhanced in the "Sport+" drive program. Here, the suspension and powertrain are even more dynamically tuned. The ECO Start/Stop function and coasting mode are deactivated in both programs. The Mercedes-AMG S 65 Sedan.